I need to get the RP out of the way by the end of this month. I keep writing a couple of lines, then I get stuck. So I go and rummage around in the electronic databases (PSYCINFO, I love you) and find another paper to give me a little boost. This is despite having decided, three weeks ago, that I’d found all the research papers I could ever need because I was moving into duplication. In between writing and angst, I argue with my firstborn (16 years old, finished GCSEs, been hanging around the house doing sod all apart from minimal housework for the last six weeks) and make drinks for son-in-the-middle who has finished school a week early cos he had an operation on his toe this week. I WANT IT FINISHED! I want to relax and do a bit of crochet, read, garden and walk the dog without feeling guilty. I want to go to the fruit farm to pick strawberries, raspberries and redcurrants before the season is over. I also want to stop eating so darned much, out of boredom and frustration. Here’s a shot of Tinker, who likes to be busy. If she isn’t busy she eats everything, including tree bark, and is consequently a right little butterball. Behind Tinker is Kizzy. 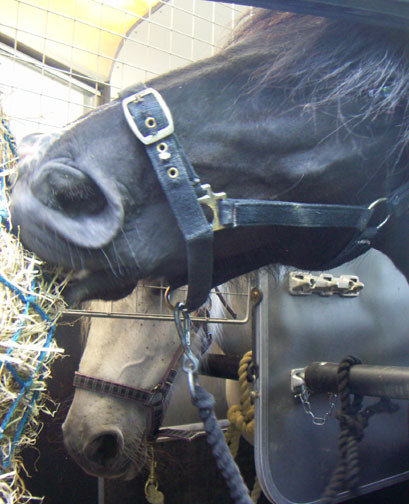 They were in the trailer as m’sister and I were taking them to the vet for an ultrasound to see if they were in foal. Despite frolicking in the field with the stallion for a couple of weeks neither was in the family way. M’father has decided that in-hand covering is the way forward.